There are few things that are more comfortable than a maxi dress. 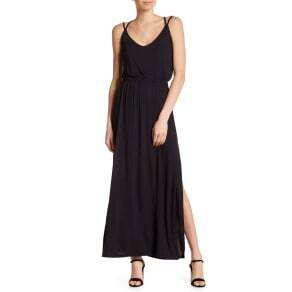 A long, flowing dress that's the perfect silhouette for almost any occasion. And styled correctly, its versatility can take you through any season. Paired with flip-flops or sandals and it will be your go-to dress in the warmer months. Choose a long-sleeved maxi-dress or add a leather jacket or cardigan to any maxi-dress and its perfect for chillier months. Concerned about fit? A maxi-dress is flattering for all shapes and sizes. An important element is length. A maxi-dress should be just touching the ground. Too short and it will cut you off. Too long and it will be dragging on the floor. But if you're 5'4' or under, not to worry. Many brands offer petite sizes. Got curves? An empire waist or an a-line maxi dress will be stunning on you. Don't have any curves? A billowy dress with a great print will be gorgeous. So whether its floral or solid, strapless, body-con or willowy you'll find the perfect maxi dress here.